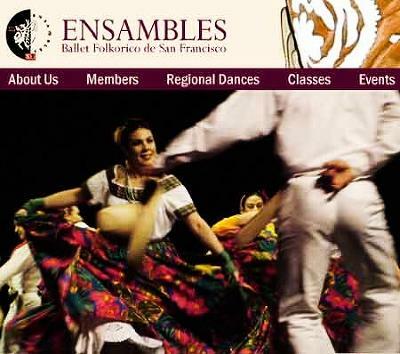 Caption Ensambles Ballet Folklorico de San Francisco is an innovative theatrical body of dancers committed to the preservation of one of the richest artistic manifestations of tradition and culture in Mexico - Folklorico Dance! Founded in 1992 by enthusiastic dances with different degrees of experience in Mexican folk dance their mission is to promote Mexican dance with quality and authenticity. Every year since 1999 with the support of local and state organizations such as The Zellerbach Foundation California Arts Council as well as local businesses Ensambles presents an annual production where they have the opportunity to bring to their audience the best they have to offer. In 2002 a Children's class was created for those 12 years old and under and had their debut performance in November 2003 during the 10th year anniversary celebrations. Other projects include hosting other Folklorico Dance companies in California and Mexico to perform and share their talent in San Francisco. Headline Ballet Folklorico de San Francisco.